Time really flies fast...Doesn't it? I still can't believe that my munchkin turned two this month. It seems just like yesterday that I was partying with my baby bump; no concern for what was there in the future. And when she came into this world (you can read it here), I was holding that wriggly little body against myself torn between taking care of her and battling baby blues. I was not an overtly motherly material; I had never held a baby before. Its slowly and gradually that I fell more and more in love with her. I have expressed time and again that when a baby is born a mother is also born! Well that means my daughter's birthday is mine too! Last year her first birthday was celebrated in Varanasi at her paternal grandparents place. You can read it here. So this year we wanted to celebrate it in a grand way in Delhi. But like every big occasion, it had its share of hiccups. Her birthday is on 11 th March but my husband had to go away to the Middle East for work. That was unavoidable so we decided to host the party later on. Her paternal grandparents arrived before her birthday and on 11th, I hosted a private celebration with her two sets of grandparents. My baby with her grandparents and a delicious butterscotch cake.. When her father arrived the next day, we started planning for the party! So much had to be done...fixing the venue, inviting everyone and so all. Everyday after work I would scout for the perfect venue. After visiting a number of party halls, we zeroed down on Panache Banquet. We finalised 26 th as the party date. It was a coincidence that 26 the was my daughter's expected delivery date. So it may not be her real birthday but was important to us nonetheless! It is so obvious that a girl as naughty would remain inside me for another fifteen days! She had to arrive early! The party venue was not too far from our place and was elegant. That was what I needed. Now the guest list, finalization of menu, return gifts and finding the perfect little dress for my doll and her appropriate accessories. But when we started inviting, we realized that it was a Saturday of a long weekend and many people were planning to go out of town. We being doctors never have true weekends; leave long weekends so it never occurred to us. Our nephew had his exams the Saturday before. We just hoped that everyone who mattered to us could make it. Every evening I would hunt for all these things. Husband was not too cooperative during all this time. Firstly he is the greatest procrastinator I have ever known. He wanted to assign a single day for all these things. Secondly the T20 Cricket World Cup is going on. If you know him even a bit, he is a cricket fanatic. And leaving a world cup match for shopping meant a lot of fight and resistance. I found the perfect party baby shoes and socks just the day before. Thankfully I was satisfied. However I was very tensed with the cake. I did not know how it would finally turn out. Finally after a week of fighting, disagreements and hardwork, the D Day arrived. We both took a leave from work and the entire morning was spent running around. I was particularly tensed with our birthday girl. She is so naughty that she often ends up getting hurt. I hate it when she has injury marks on her face and that too on her birthday. Fortunately she went to her afternoon nap and that meant she would remain fresh for the rest of the evening. She got late in waking up. The clock struck seven. It was time for the guests to arrive but our princess was in deep slumber. My parents and my father in law left for the venue while we got dressed. My princess finally woke up. As soon as I dressed her up in her fancy dress, she knew we were headed to a party. The only thing which she did not know was that the entire party was dedicated to her! Its my munchkin's second birthday! The party was perfect...at least up to my expectations. I still had not seen the cake. I saw it on the cake table itself; just before the cutting ceremony. It was perfect. The upper tier had pineapple flavour while the lower one was chocolate. The food and decor was exactly as I wanted. All our close friends made it to the party including the owner of Valeda Wellness Centre and the renowned Dr Seema Bali mam (my employers). I was elated. After an evening full of merry, it was time to go home. 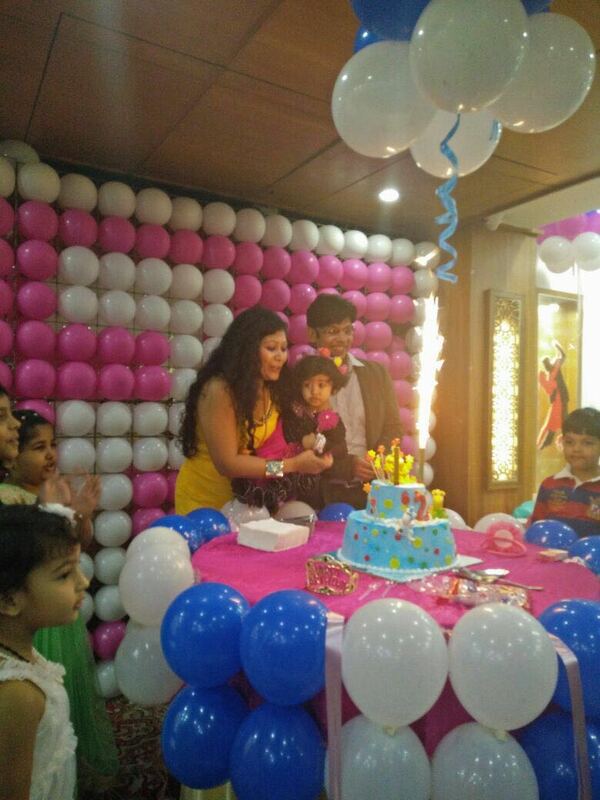 The guests were amazed that the little birthday girl did not even whine for once. They did not know what kind of party girl she is! She danced the entire evening! I bet she is going to give us a lot of trouble as a teenager! The photographer aka the husband took out time for taking a solo photo of me! Look at the expression on my daughter's face!! Party over time to go home! Party girl back in her normal attire!! So lovely and cute!! Happy birthday!!! Such a little princess so cute Happy Birthday may it bring you health and blessing. Such a cute post..love the pic of ur daughter posing with Winnie the Pooh...both have matching smiles.